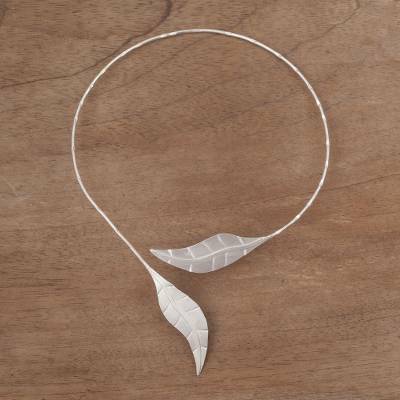 Handcrafted Leaf Sterling Silver Choker Necklace, "Andean Frost"
Frosted in sterling silver, chard leaves fall gracefully in the feminine design of this choker. By the Kocchiu Brothers of Peru, the choker is crafted with artistic elegance featuring a matte finish on the leaves, and a hammered, polished finish on the choker. "There are still daily challenges to contend with because learning, evolution and development are constant." "Nicolas and I, Roberto, where born in Lima but we grew up in Ilo, a port in Peru's southern coast. We weren't fishermen, we actually looked after an olive grove, but our experiences by the sea have had a decided influence in our lives. They are present in our designs. "Art has always been, and will always be, present in our family. Our father did amazing carbon drawings, our aunt Isabel paints, and the piano in grandma's house always gave us great music. Artistic inspiration runs in our family. "We spent our youth in the bohemian district of Barranco, where we met fine artists, poets, musicians, writers and philosophers that marked our lives. I got a scholarship at an art school in Lima, and I enrolled in a sculpting class for fun more than for any other reason. It became a turning point for me, I realized how art is my life and I enrolled in other courses such as painting, pottery and lost wax jewelry. I had originally wanted to study business administration, and instead I decided to heed the call of art. "I have been working with Nicolas since 1995, he has a unique patience and calm for making jewelry! "I am lucky in that my hobby is my profession: I enjoy designing and crafting jewelry so much that I don't really need a hobby. My profession keeps me entertained. "I think that what stands out from our collections is the fantasy inherent in every design. There are some recognizable influences in our collections, like pre-Inca drawings with their unique figures and geometric forms like the 'waves with stairs' like I like to call them. When I was studying I developed a sense of artistic freedom, where I give free reign to my imagination without being tied to convention. I am also influenced by the Europeans' aesthetic minimalism, and the third factor in my designs is everything that has to do with the sea, warm memories from childhood. "First comes my life, then comes my art. I cannot fathom my life without creativity, the freedom to express myself through silver. This freedom motivates me to keep creating and it reflects who I am. "Nicolas and I have been fortunate to have been invited by different organizations that support the development of artisans to show our work in different countries throughout America and Europe. "Getting started wasn't easy – it never is but I think it's harder when it has to do with art. And that was my biggest challenge. At first it literally was 'for the love of art' and it was a great struggle just to survive. But then with time and experience it all became easier. There are still daily challenges to contend with because learning, evolution and development are constant. "And so it is that we can offer you jewelry pieces filled with fantasy and originality."